I loved the cake very much. The cake is tasty, very moist and soft though it was not as fluffy as what I wanted it to be. 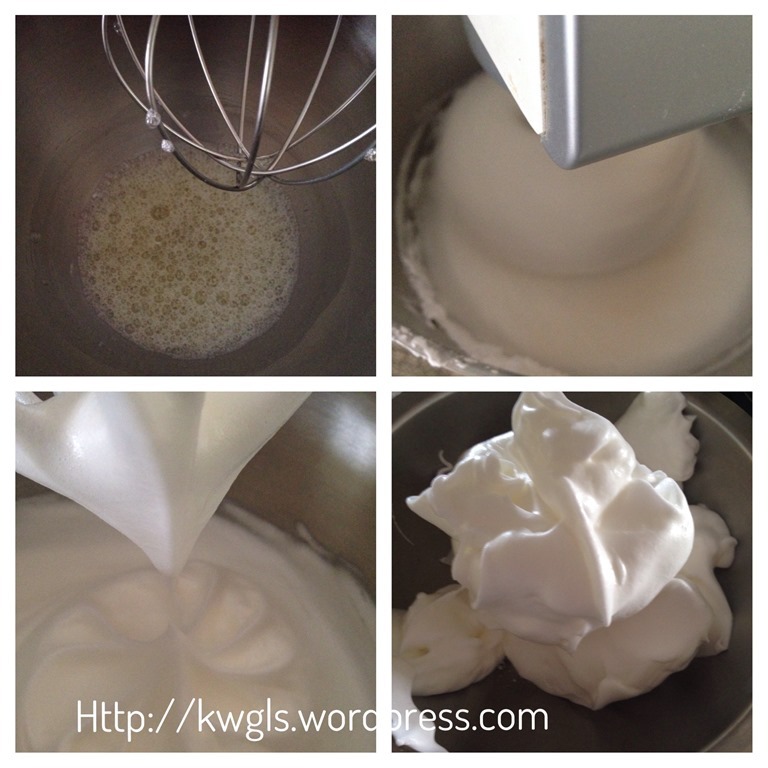 However, I believed that it is my fault because of my hurry folding of meringues (egg whites). That morning, I was extremely busy and rushing to send my kids to school. I am rather impatience when I folded the egg whites and I forgot to knock the baking tin against the table, therefore, some meringues were trapped in the batter causing the cake becoming dense and have holes on the top part of the cake.. That is my mistake and not the recipes fault. 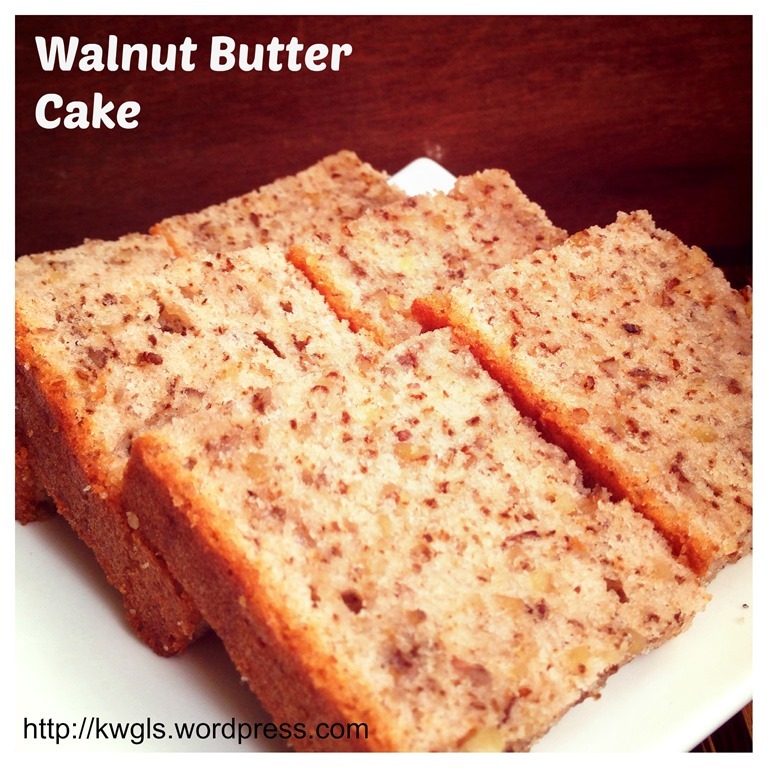 I am still very pleased with the cake..
One member in the Facebook Group asked me whether I have a walnut cake recipe. I said I did not but will be in my to do list. 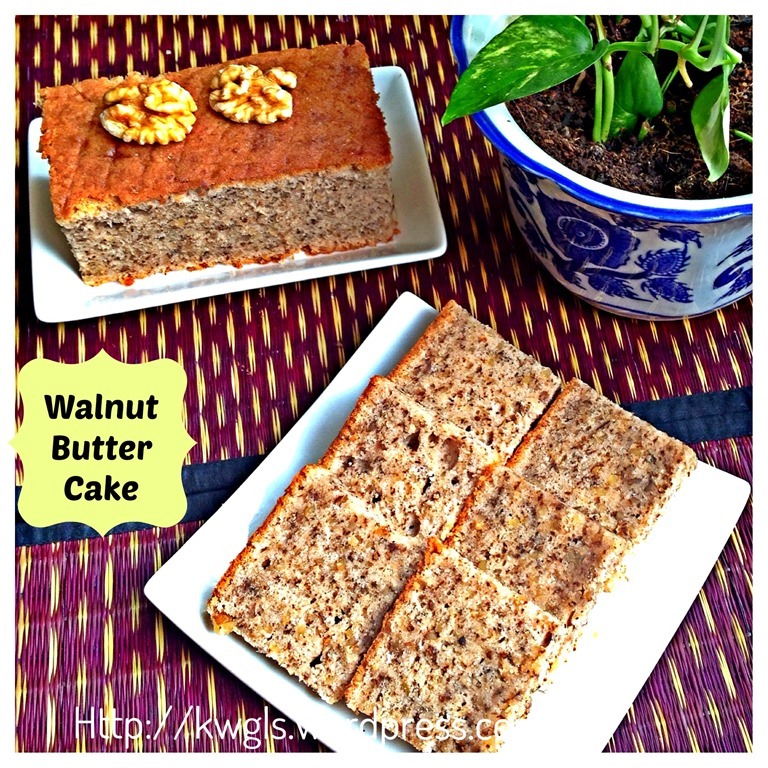 When I Googled the walnut butter cake recipes that morning, I found a few recipes and decided to select this recipe : “Indonesia Walnut Butter Cake”. 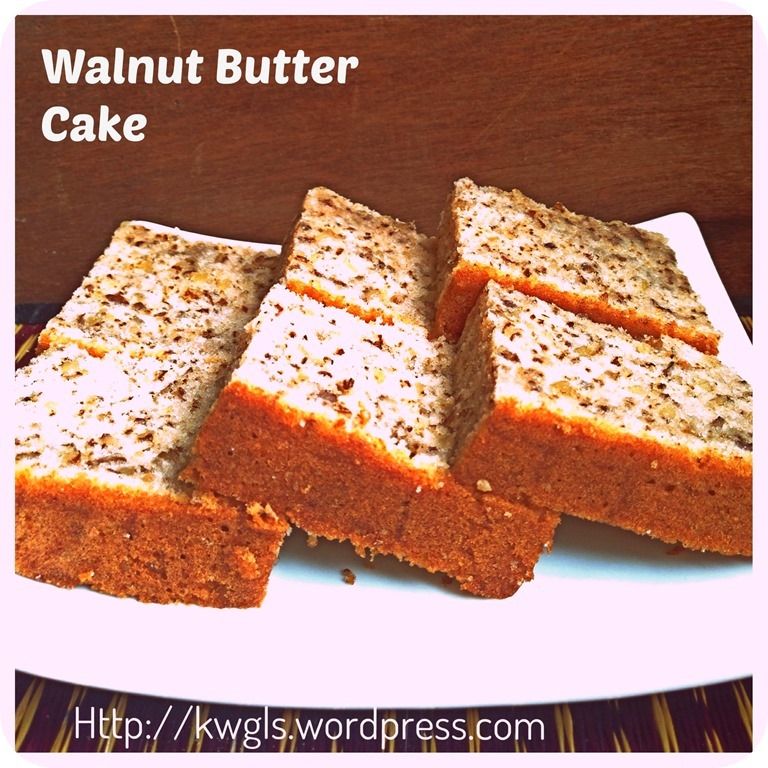 I have selected this recipe because it looked like the walnut cake that I used to eat. As to why the name was associated to Indonesia still puzzled me. 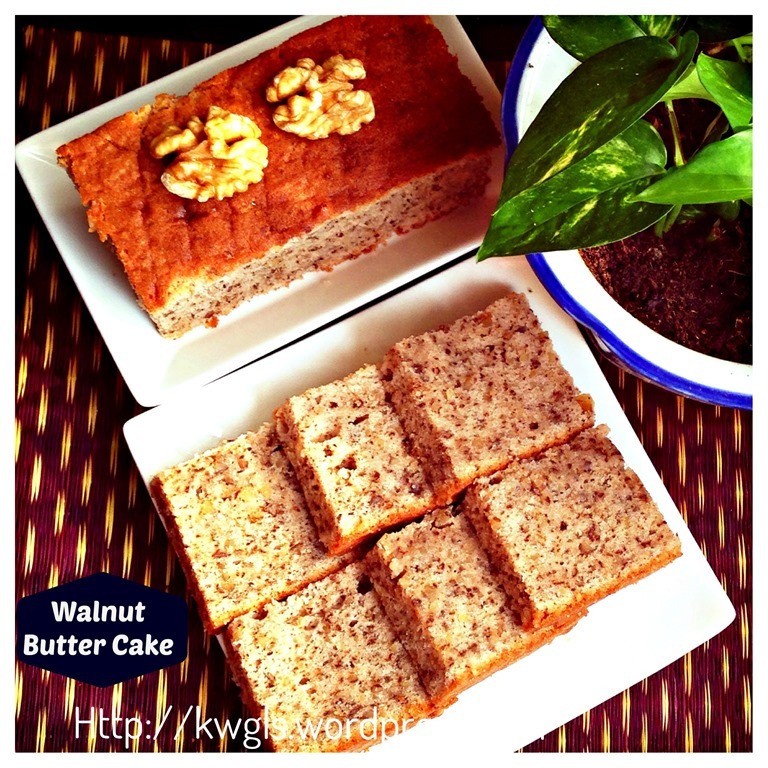 However, in Singapore, there is a famous bakery – Begawan Solo (a bakery that sells a lot Indonesian cakes and cookies) have this cake as one of their popular cakes. 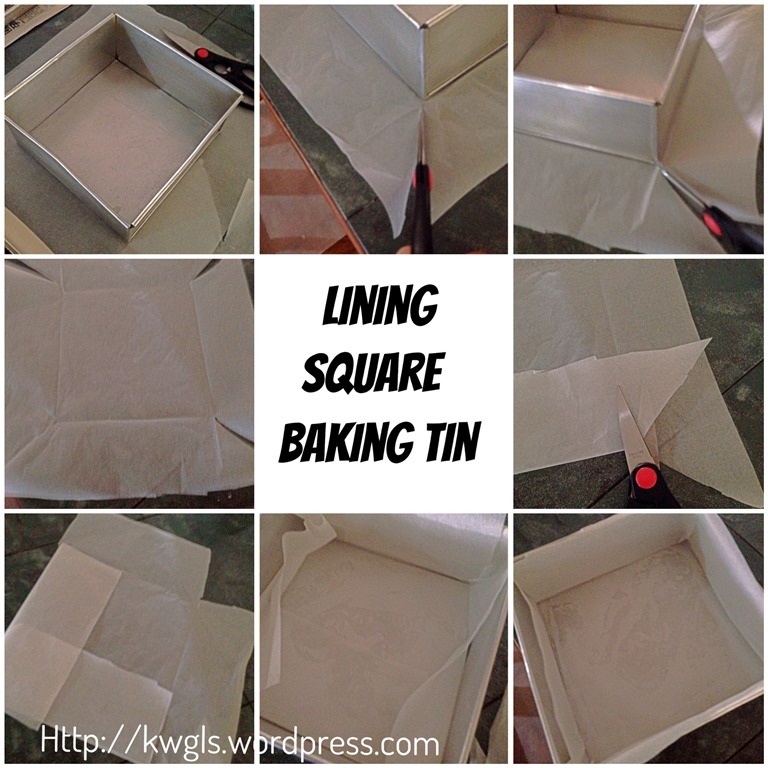 Lightly greased a 9’’ x 9’ square baking tin or line the baking tin with parchment paper. 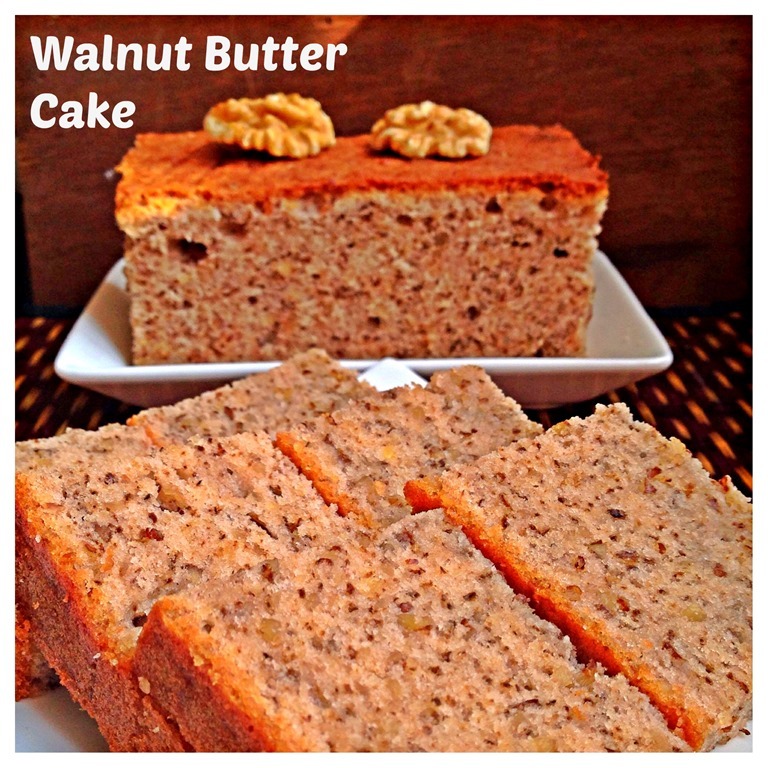 Blend the lightly toasted walnut using a food processor until as fine as possible. Set aside for later use. 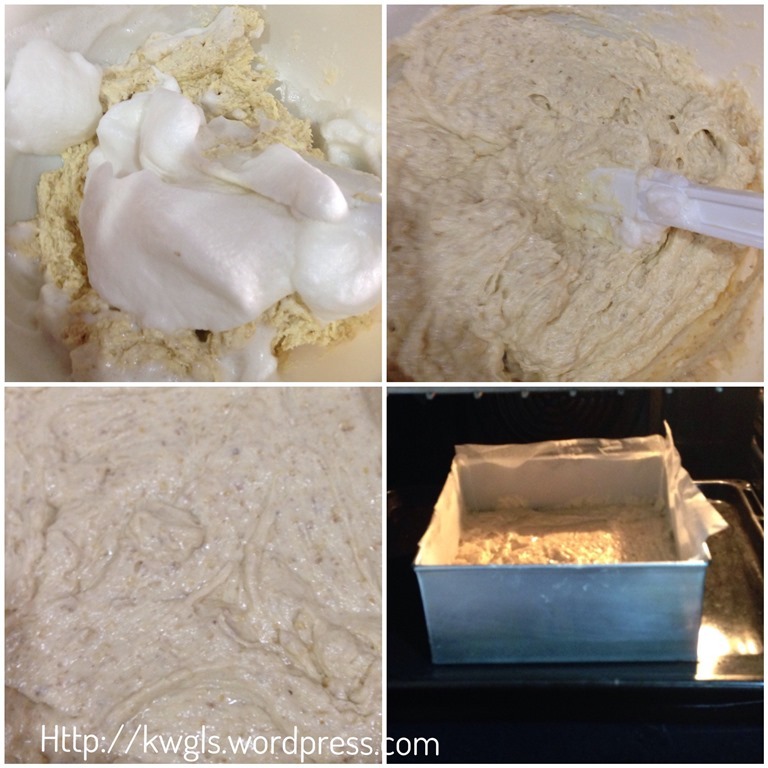 In a big mixing bowl, cream half of the sugar (100 grams) with butter until light and fluffy. Add one egg yolk at a time, beat until well mixed. Repeat the same for the other 3 egg yolks. Scrap the sides and bottom of the mixing bowl ensure there is no unmixed egg yolk settled at the bottom of the mixing bowl. Sift in the plain flour and baking powder. 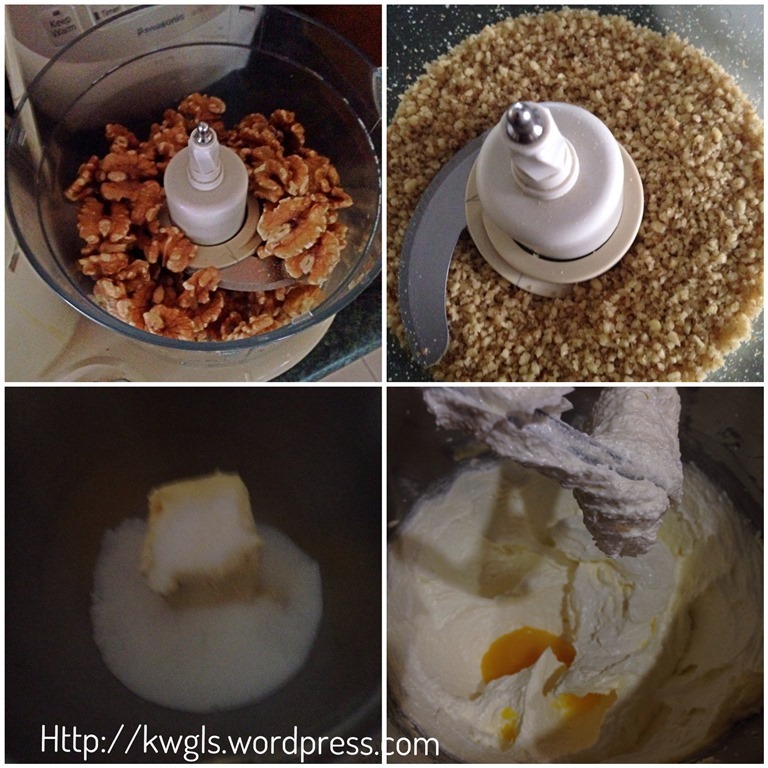 Add the chopped walnuts. 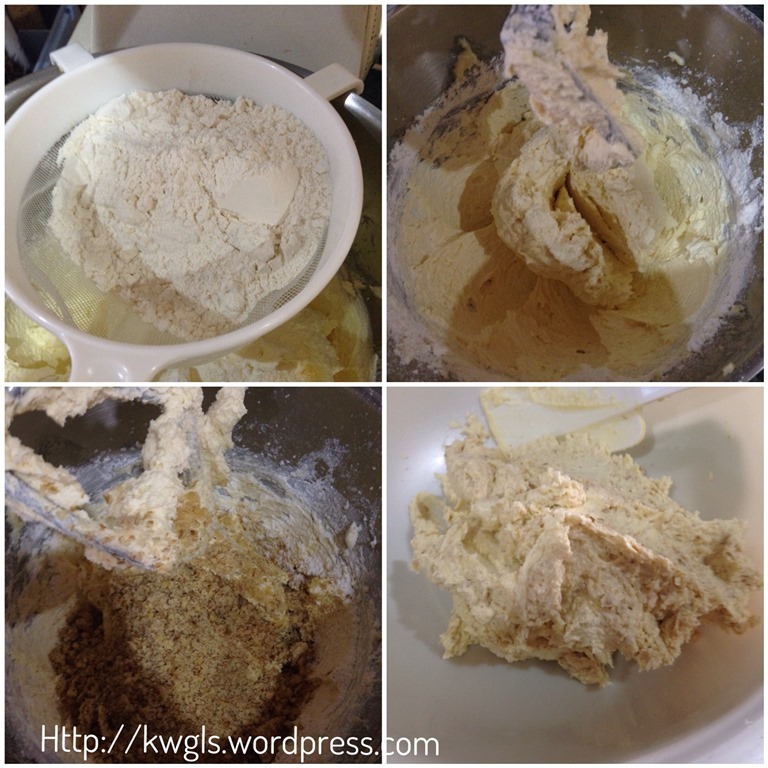 Use the mixer’s slowest speed to stir the batter until well combined. Add the fresh milk and fold until well mixed. Scope out to another mixing bowl for later use. In another clean mixing bowl, place your egg whites and beat using the machine whisk to whisk the egg whites until soft peak. Note that the bowl have to be extremely clean, dry and free of any oils. When the volume expands, add in the sugar (100g) gradually, beat until thick and glossy and until all the sugars dissolved (firm peak). Spoon the egg whites into the batter. Fold in the egg whites as swiftly and lightly possible until all the ingredients are well combined. 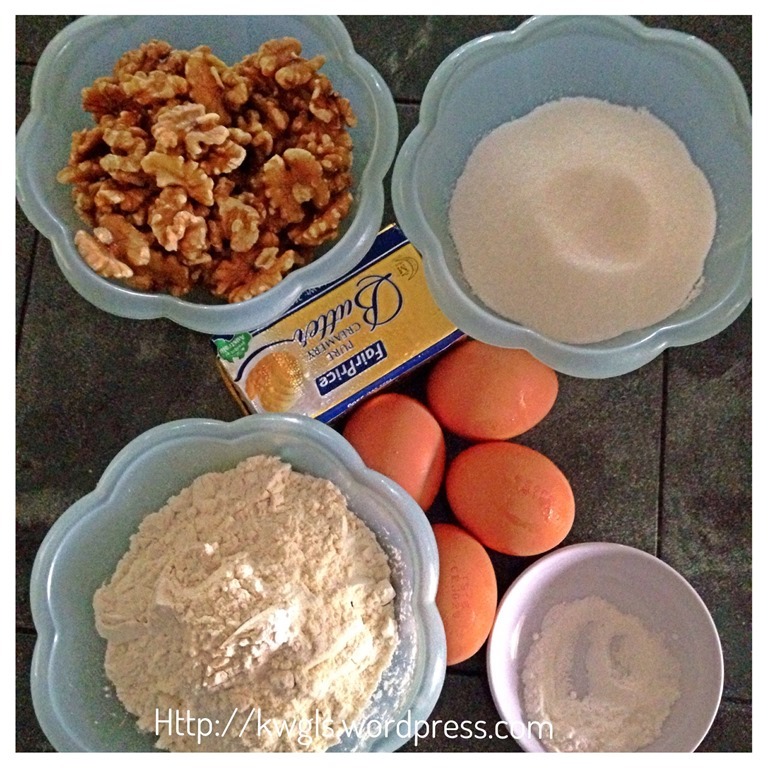 Transfer the batter to the lightly greased baking tin or baking tin lined with baking paper. Knock the baking tin on the table a few time to ensure there is no trapped egg whites in the batter. Level and bake at 160 degree Celsius for about 45-50 minutes or when a skewer inserted comes out clean. Rest the cake for at least 1.5 hour in the cooling rack before cutting. It is best to leave the cake overnight before serving if time permits. Don’t judge this cake by the images you have seen in this post. It is a nice cake and I have to apologize that the dense look is because of my hurried folding of the egg whites. Trust me, by following the procedures above, you will definitely be able to come out a much better cake than I do. 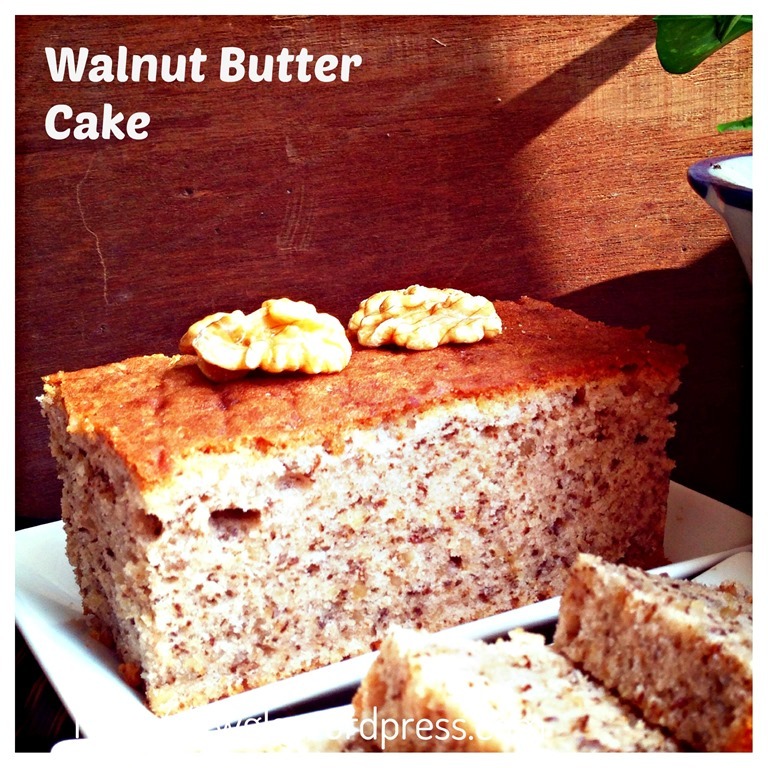 Taste wise is full of walnut flavour, moist and buttery. 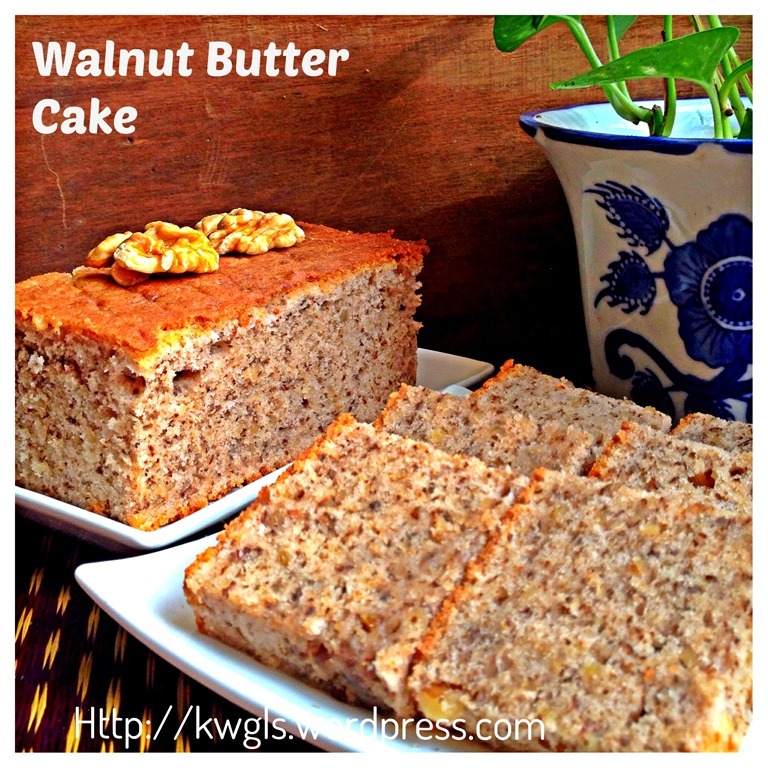 This entry was posted in Cakes and cookies, Chinese New Year 2014, Food Preparation Series and tagged GUAI SHU SHU, Guaishushu, indonesian walnut butter cake, kenneth goh, postaday, walnut butter cake. Bookmark the permalink. Thanks for dropping by. I am sure you are able to bake better than me. Newer recipes mostly called for unsalted butter.. If there is a need , ingredients will call for use pinches of salt to make it salted butter. 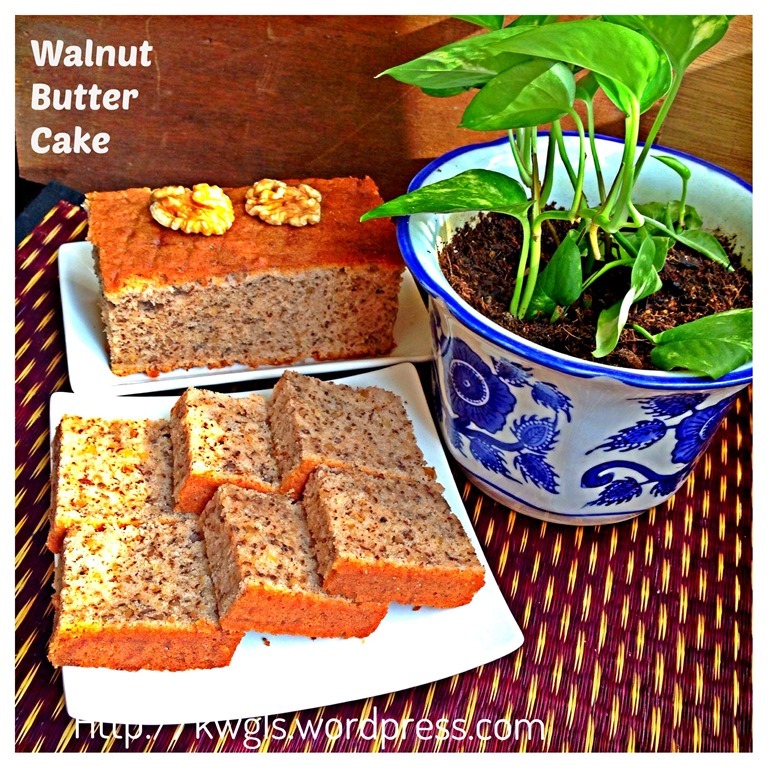 Yeah, thanks for sharing, is this the Indonesian walnut butter cake? 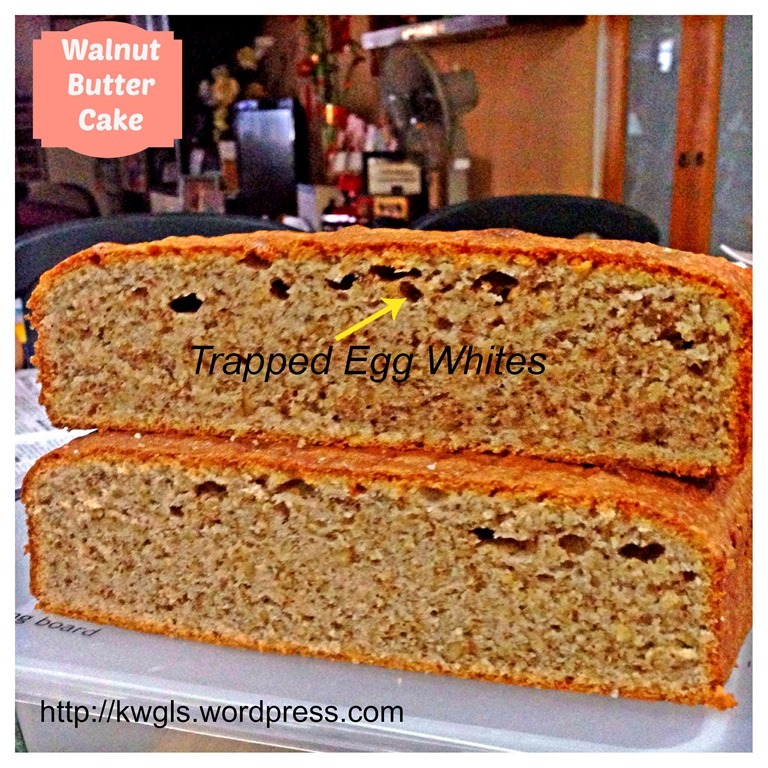 Pls can tell how to toast the walnut? Hi, I wwould appreciate some advice as my cake turned out rather flat. Any ideas where I went wrong? 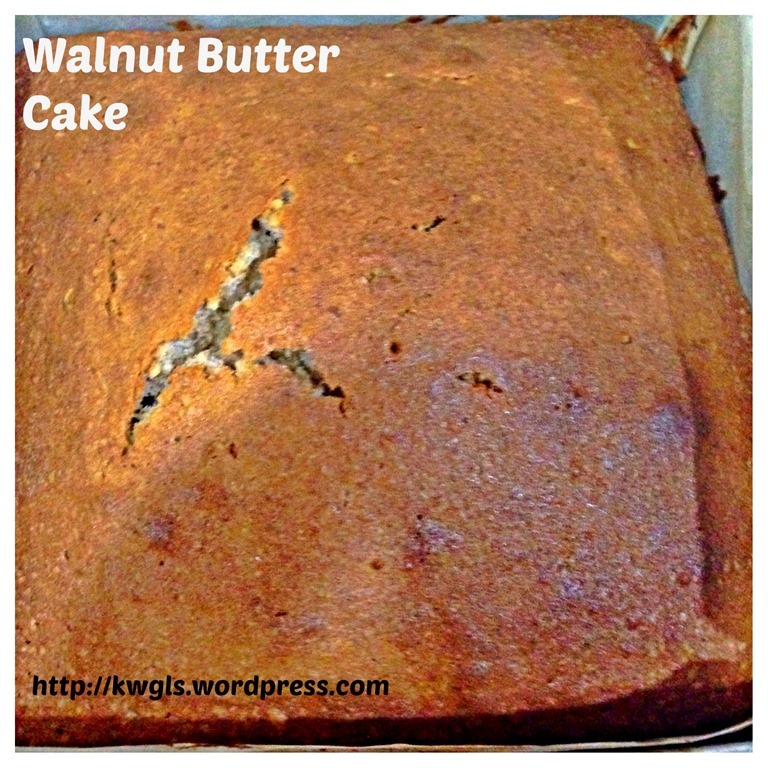 I suspect the walnut mixture was too fine. Could that be it? The cake tasted fine except it was oily to touch even more than usual for a butter cake. I m attempting this recpe again. Wish me luck! Unsure about what you mean by flat.. This cake is flat top. If it is tall and flat, it should be the case. If it very short and flat, it could be due to your egg white have deflated during mixing. I am sure you can do it.. 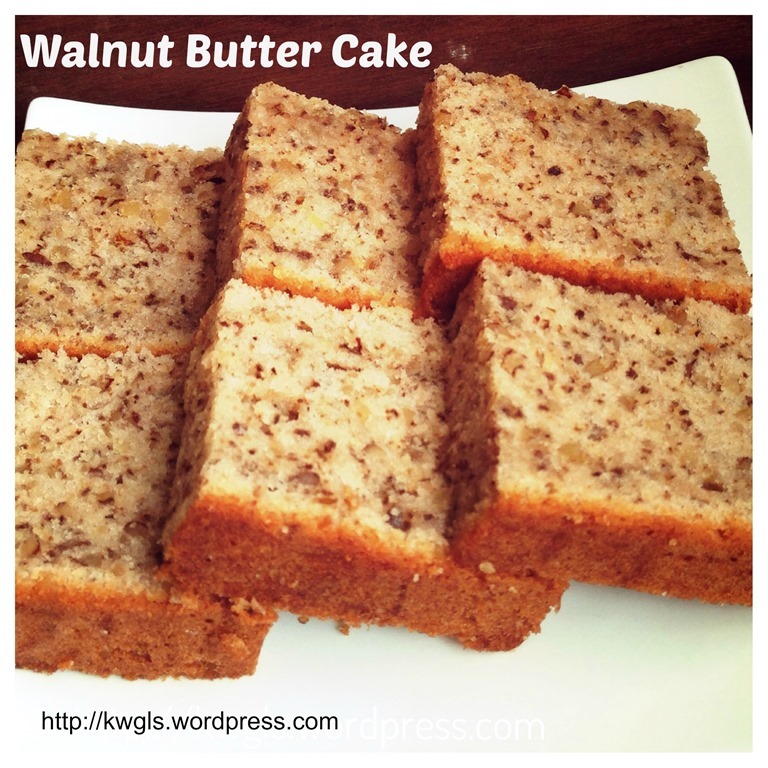 I am craving for walnuts butter cake and browsing for recipes. Yours read simple and easy. I’ll try it out today. By the way, (1) have you tried using cake flour instead of plain flour? As I shop, Prima Cake Flour for all type of cakes. How will the texture turns up? Please advise. (2) Some recipe beat whole eggs instead of separate egg yolks & egg white. Please advise any great different. Thank you.